Khodorkovsky’s defense asks court to revoke sentence and close case | Russian Legal Information Agency (RAPSI). MOSCOW, May 24 - RAPSI. The defense of former Yukos head Mikhail Khodorkovsky and his business partner Platon Lebedev has asked the Moscow City Court’s Cassation Board to overturn their sentences and to terminate the criminal proceedings due to a lack of evidence, the Russian Legal Information Agency reported. The defense counsel insisted on the prosecutors’ legal ignorance and claimed that the court should have decreased the amount of oil allegedly stolen by Khodorkovsky and Lebedev, as the prosecutors partially withdrew their accusations. During appeal examination, Khodorkovsky took the floor, claiming the charges against him were ridiculous. Moscow’s Khamovnichesky District Court found Khodorkovsky and Lebedev guilty of stealing 200 million tons of oil and money laundering and sentenced them to 14 years in prison in late December. The former oil tycoons have already served seven years in prison for convictions in their 2004 trial. 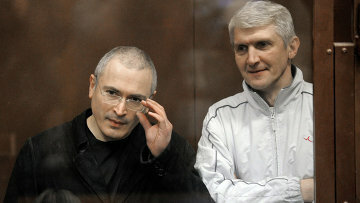 The Yukos case is one of the most high-profile criminal cases in Russia today. 14:55 24/05/2011 The defense of former Yukos head Mikhail Khodorkovsky and his business partner Platon Lebedev has asked the Moscow City Court’s Cassation Board to overturn their sentences and to terminate the criminal proceedings due to a lack of evidence.